So there I was in Gettysburg, Pennsylvania, for a family vacation. Gettysburg, of course, is synonymous with two things: the Civil War battle that took place there July 1-3, 1863, and ghosts. The whole town is a paranormal hotspot, but within the hotspot there are other legends. Here’s one for all of you single ladies itching to get hitched. While we were getting ice cream across the street from the Jennie Wade House at 548 Baltimore Street, I told my 18-year-old niece, Lauren about a legend I heard attached to the Jennie Wade House. What a great niece! She was willing to be my guinea pig. First some background. Jennie Wade has the unfortunate distinction of being the only civilian killed during the battle of Gettysburg. 20-year-old Jennie Wade was the fiancée of Corp. “Jack” Skelly. Skelly was wounded and taken prisoner at Winchester, Virginia, on May 13, 1863, and was transferred to a hospital in Virginia. Back to the house on Baltimore Street. It was inside this house on the morning of July 3rd, 1863, when a Confederate sniper’s musket ball smashed through the door on the north side of the house, pierced through another door in the kitchen, and struck Jennie in the back beneath her left shoulder blade, killing her instantly. Union soldiers heard the cries of Jennie’s sister and mother inside the house and rushed to assist. They carried Jennie’s body to the basement. A few days after the battle, she was buried in Evergreen Cemetery in a coffin that Confederate soldiers had built for an officer. Jennie’s fiancé, Corp. Skelly died from his wounds nine days later in Confederate hands. It seems the lovers were destined to be together after all. The hole left by the lethal musket ball can still be seen today. And here’s where the legend begins. The story goes that single women who place their ring finger through the hole will receive a marriage proposal within a year. According to Joe Svehla who manages the Jennie Wade House, they receive several emails each year from women claiming they were proposed to after sticking their ring finger in the musket ball hole in Jennie’s door. 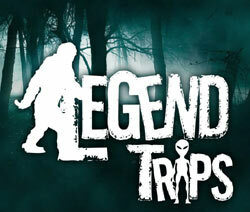 I love this legend trip because it offers a physical connection to a real person. You remember Jennie when you place your finger in the hole that caused her death a split-second later, but you also have hope for your own romantic future. Legends are always about the living. The dead have only a supporting role. Lauren placed her finger in the bullet hole on the evening of July 20, 2010. So the countdown is on. I’ll report back if a proposal comes her way. Thankfully, there’s nothing in the legend that says she has to accept the proposal if the guy is a loser.